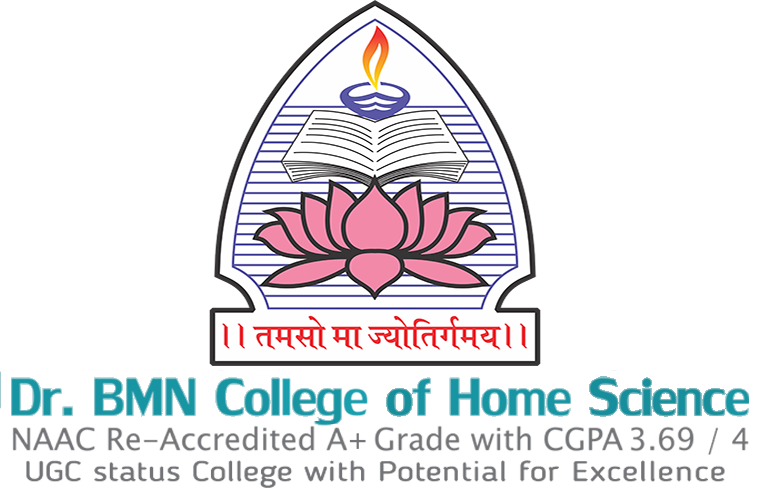 Dr. Bhanuben Mahendra Nanavati College of Home Science established in 1984, has always sought to be a pioneer in academic pursuits. The college was re-accredited by National Assessment & Accreditation Council (NAAC) with ‘A+ Grade’ and CGPA 3.69/4. In May 2016 we received UGC status of ‘College with Potential for Excellence’. In July 2017 we received best college award from S.N.D.T. Women’s University. • To foster a healthy learning environment. • To make teaching and research relevant to societal needs. • To inculcate a humanist outlook in students by means of value based education, and community outreach programs. • To focus on vocationalization of courses and skill development. The college is affiliated to S.N.D.T. Women’s University and offers an interdisciplinary Home Science Program at undergraduate and postgraduate level. As a multi-faculty institution, we also offer a degree programme in Computer Applications (BCA). The program is of 120 credits over a span of six semesters for our undergraduate programs and 96 credits for MSc program over a span of four semesters. Seva Mandal Education Society has been a pioneer in providing qualitative educational facilities to girl students for the last six decades. We started on a humble note in 1957 with just seven students and today our campus which is located in the central suburb of Matunga houses eight institutions with over 6000 female students. We offer every educational opportunity ranging from Junior college to undergraduate programs postgraduate programs and certificate courses in faculties of Arts, Commerce, Home Science, Computer applications,..
Our faculty are well qualified, and committed to student-centric approaches and innovative teaching-learning techniques and evaluation methods. Teachers are geared towards making learning an enjoyable and enriching experience and share a healthy rapport with students. We have collaborative projects with industries such as Marico Ltd, Pepsico India Ltd, Vissco, GfxBandits IT Solutions & Skynet Secure Solutions. The ongoing intensive Gender Sensitization program under the ‘Jagar Janivancha Abhiyan’ initiative of the Government of Maharashtra was awarded first prize at University level and second prize at District level in the year 2012-2013 and First prize at District Level, First Prize at University Level and Second Prize at State level in the year 2013-2014. The college NSS unit conducts activities in collaboration with Adipath foundation and Research Centre, Young Women’s Christian Association, Ashadeep Association, Rural Community Development Centre, Red Ribbon Club, Mumbai District AIDS Society, Rotary Club of Bombay Uptown, Inner Wheel Club, Lions Club of Sion and Shraddhanand Mahila Ashram. In addition, each department conducts community outreach programs in collaboration with NGOs and Industry. Our students participate in a range of inter-collegiate co-curricular and sports events. They have shown exceptional promise by winning laurels at national, state and university levels. Several college level awards have also been instituted to motivate students to give their best. Faculty are also constantly upgrading their research and teaching skills through presentations and publications at international and national level.